Ground to air target illumination. The war fighter requires seamless communications between ground/air for situational awareness and identification of targets. In today’s modern battlefield, warfighters must be ready at all times, for both offensive and defensive operations. This level of readiness requires network communications capabilities without any gaps from ground to air or between systems, both old and new. Gateway devices are bridging the gap that often exists between legacy systems and between air and ground forces, enabling warfighters to be agile and informed for greater mission effectiveness. Modernizing the battlefield and connecting devices is top of mind to ensure warfighters have critical information at their fingertips to navigate and communicate. As technology evolves, there is often a gap between communications that occur, between air and ground, when dealing with older legacy systems. As new technologies enter the digital battlefield, gateway technologies are needed to help new communication systems to communicate with legacy equipment that use different protocols. Warfighters require quick access to data, sharing information on where friendlies and adversaries are positioned, along with the ability to share data and communicate in any situation. Gateways have been used to help solve this ongoing issue of communicating between new systems and legacy systems. Yet in the past these devices have often been cumbersome and difficult to use in combat scenarios. Today’s gateways continued to evolve into more portable devices that allow for greater access and ease for the warfighter on the ground. Gateway terminals are typically mounted to vehicles and can weigh six tons, with a generator required to ensure that the system is cooled properly. The mobility of the terminal is often lacking, without the ability to go off road. Gateway devices require agility and the ability to move with the warfighter through rough terrain. As gateway devices become smaller and more portable, it can move with the warfighter without the cumbersome requirements of older gateways. In a typical battlefield, there are a vast number of communication devices using specific protocols. Airforce, Navy, Army each have their own protocols and requirements. But on the battlefield, it is critical for troops to communicate and share information. Data link software integrated into gateway devices offers the ability to seamless communicate between forces. The degree of connectivity on the battlefield is often spotty and the ability to watch or view large files is often unavailable. Today’s gateway devices can network in all the videos and can store and forward the video and get it published out to you from the operation center. Recently announced, Rockwell Collins has launched a FasTAK solution, which features a wearable targeting system available in Microsoft Windows® and Android™ operating systems. 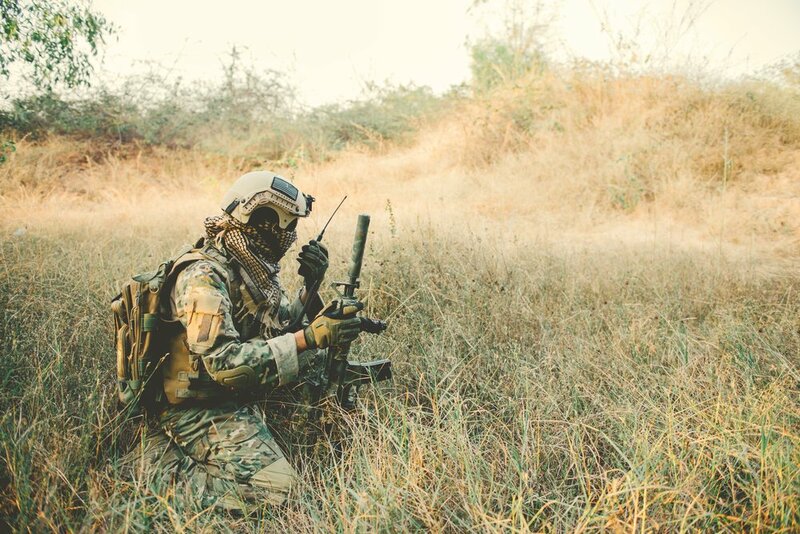 Using a mobile phone or tablet, the system offers easy-to-use applications to arm warfighters with powerful communications data that integrates with existing lasers, radios and GPS devices. The standard system delivers with a fully-integrated set of hardware that includes a laser range finder, tactical computer, video downlink receiver and the FasTAK digital targeting software. The system is low weight compared to legacy solutions. The Windows variant weighing less than six pounds and the Android variant under three pounds.